The invasion is underway. The Profit Snatchers are here to destroy your car business and take your money. The government keeps piling on regulations and red tape. Customers want every car below invoice. The media has convinced the public you're ripping people off-it all makes this business less fun, less rewarding, less fulfilling, less lucrative and less interesting than ever before. Jimmy Vee & Travis Miller have launched a direct assault against the invaders. 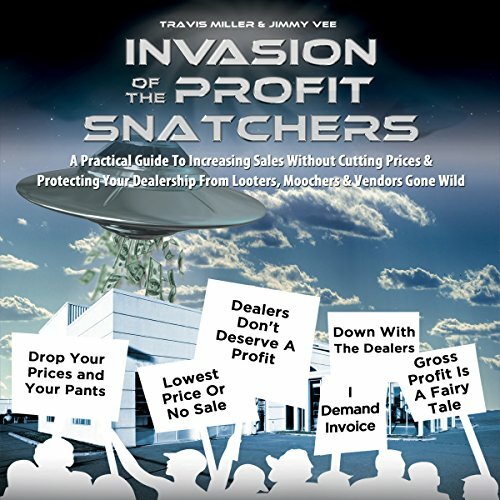 In Invasion of the Profit Snatchers, the authors call dealers, managers and industry professionals to arms and offer a simple solution to a serious syndrome: stop selling cars at low prices. It's time to think bigger about the impact you can have on the world. It's time to recognize and be rewarded for your true value. It's time to commit to quantum change and stop selling cars at low prices and start offering, marketing and providing something in much greater demand. You can't wait until later to change the direction of tomorrow. It's not too late to turn this industry around. The future of the car business is yours to create. The authors, along with their vast network of like-minded dealers, are here to help In this book, Jim & Travis share their unique methods for transforming your business and building a profitable dealership and an amazing life that is ESP - Enjoyable, Simple & Prosperous. A sales pitch for their service. An infomercial. This could have been really useful if they gave more useful tips. The book has the feeling of freeware. The talk about the problem, talk about how great they are, give a few tiny tidbits about what you can do, then suggest you contact a RICH advisor to learn more about their services. It would have been much better if they spent much more time about giving specific examples of what dealers did instead of saying "Dealer X says Jimmy and Travis are great". Has Invasion of the Profit Snatchers turned you off from other books in this genre? I paid to listen to a commercial. Would you be willing to try another one of Travis Miller and Jimmy Vee ’s performances? If you could play editor, what scene or scenes would you have cut from Invasion of the Profit Snatchers? Half the chapters could have been cut. Book should be free to the public as it only serves as a preliminary advertisement to the services the author sells. I love it when the authors of the ones performing the audiobook. They typically are more passionate, engaging, and enjoyable to listen to since they truly know what they're talking about. This book is no exception. I listened to these guys speak at a marketing conference which led me to this book. I'm not even a car dealer and I found this to be a great resource. I can only imagine how mind blowing this would be for a car dealership. I know a couple of them and will most certainly recommend this book to them.